Continue from Part 1. This part will focus on installing each RD roles before start the actual configuration. 1. 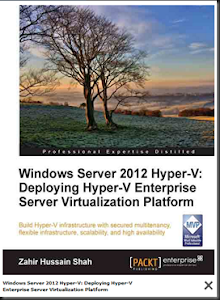 Log on to RDSVH with administrative right. 9. Restart the system when asked. 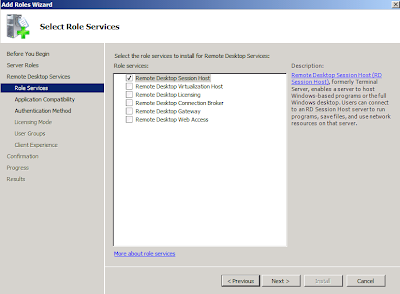 Note that the purpose of installing the RD Session Host role service for this solution is for it to act as a Redirector and not for RemoteApp publishing. 10. 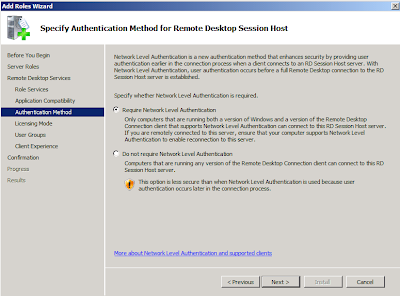 On the Specify Authentication Method For Remote Desktop Session Host page, select "Require Network Level Authentication" and click Next. Your client must be running minimum Windows XP SP3 (with some configuration that you need to perform) or later in order to support Network Level Authentication. I'm talking about your offsite computer (that's what i mean). 11. 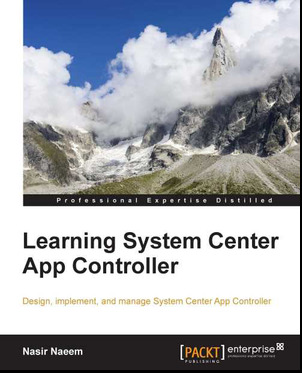 On the Specifying License Mode, select Configure Later and Click Next. 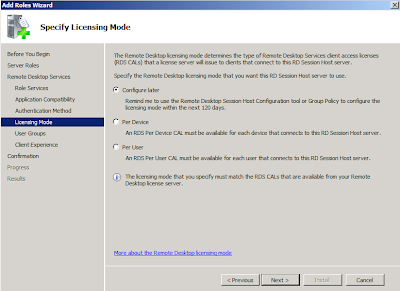 You can run RDS for 120 days before activating the license. Remember to get the license before the expire date. 12. 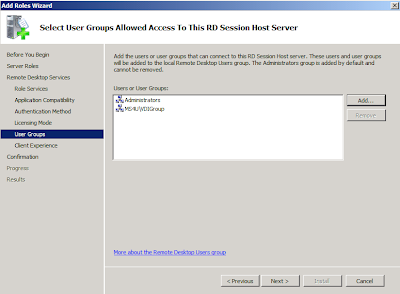 On the Select User Groups Allowed Access to this RD Session Server, click Add button and Enter VDIGroup. 13. Click Check name and click Ok button. 17. 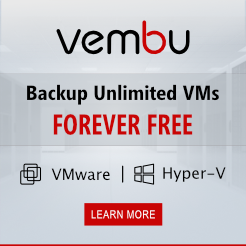 Click Close button and select Yes to restart the system. 9. Review Confirm Installation selection and click Install button. The installation process will begin. 11. 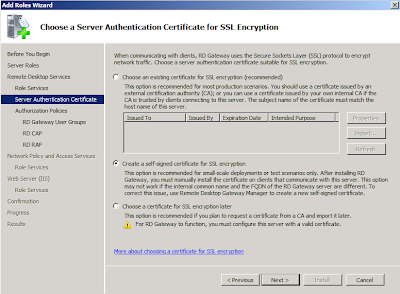 On the Choose a Server Authentication Certificate for SSL Encryption page, select Create a self-signed certificate for SSL encryption, and then click Next. 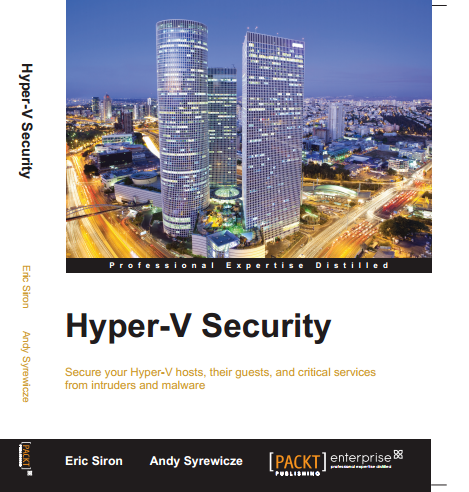 It is recommended to get a 3rd party certificate/External Certificate. 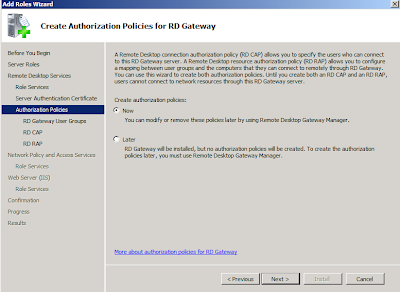 12.On the Create Authorization Policies for RD Gateway page, select Now, and then click Next. 13. 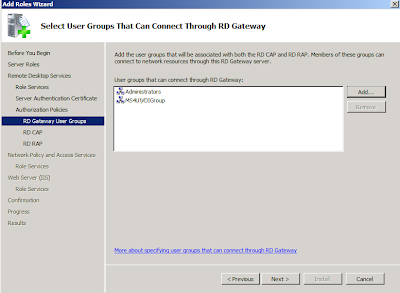 On the Select User Groups That Can Connect Through RD Gateway page, click Add. In the Select Groups dialog box, specify VDIGroup, and then click OK to close the Select Groups dialog box. Click Next. 14. 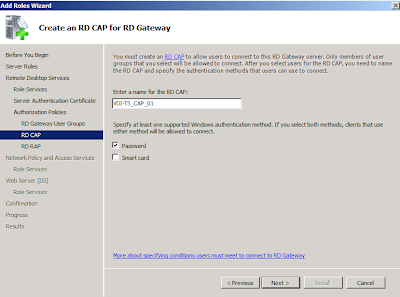 On the Create an RD CAP for RD Gateway page, enter the name VDI-RD_CAP_01 for the Remote Desktop connection authorization policy (RD CAP), select Password, and then click Next. 15. 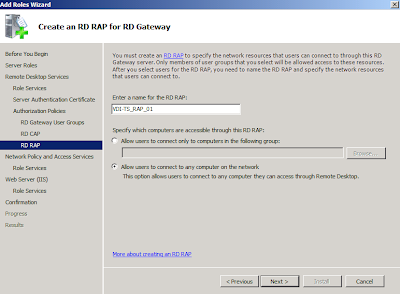 On the Create an RD RAP for RD Gateway page, enter the name VDI-RD_RAP_01 for the Remote Desktop resource authorization policy (RD RAP), and then select Allow users to connect to any computer on the network. Click Next. Note: You can limit user to connect computer on the network. 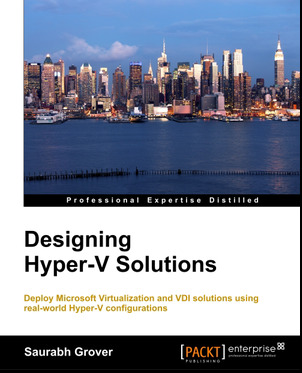 If you would like, you can create a VDI computer group and put the computer pool into this group. 16. On the Network Policy and Access Services page (which appears if this role service is not already installed), review the summary information, and then click Next. 17. 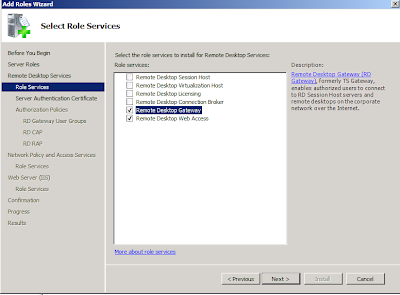 On the Select Role Services page, verify that Network Policy Server is selected, and then click Next. 20. On the Confirm Installation Selection Page, click Install button. The installation process will begin. The default URL is https://RDSGatewayWeb/RdWeb . 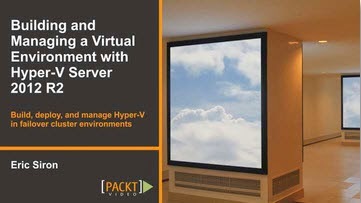 Use this url for accessing the VDI. Thanks for sharing this informative blog. 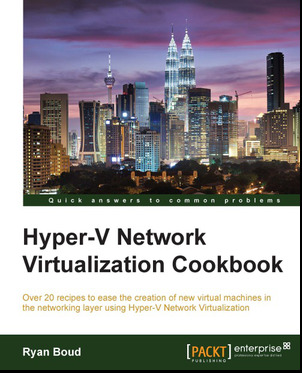 It is helpful for creating the network set-up. Network Cabling Services Houston will provide the networking services as per the need of the clients.